There are plenty of times, especially when it’s too cold to entertain the idea of leaving the house, when I want to spend all day making dinner — not a multicourse meal or anything like that, but something wildly ambitious like rolling my own pasta dough and cooking a six-hour Bolognese to assemble into a 75-layer lasagne, or making honest-to-God carnitas to eat with hand-pressed tortillas. There are other times, regardless of the weather or how much time I have, when I definitely do not want to do any of that. Maybe I’ve had an especially busy week and I just want to do something a little mindless, like searching for hours for the perfect new show to binge-watch (without actually selecting a show) while eating popcorn for dinner. And then there are the in-between nights, when I want something that feels nice and kind of thoughtful, without, you know, all the work. These are the nights I like doing things like roasting a large piece of salmon, either just for myself (which feels extremely luxe) or to feed friends. It’s the kind of quick-cooking dish that is infinitely adaptable, a blank canvas for all my dinner dreams. That can mean a tweak as simple as making a sauce in which to bathe the salmon, rather than reaching for a bottle of olive oil. In this instance, I am talking about an extremely delicious sauce made from garlicky browned butter, a tablespoon or two of harissa (the Middle Eastern chili paste made with hot peppers, spices and, occasionally, tomato), and a good bit of vinegar, to keep things tangy and spoonable. It takes all of 4 minutes to make. The thing is, once this sauce is done and poured over the salmon, the rest takes care of itself. Throw it into a 325-degree oven for 10 to 15 minutes, then it’s ready to be dressed up or down, eaten alone or in the company of others, consumed that evening or the next day as part of a definitely not-sad desk lunch. While eating a fillet of salmon all on its own with a glass of wine might seem kind of chic, you’ll likely want to serve it with something else, like a fluffy bowl of rice or grains, quickly sauteed greens or a bowl of roasted vegetables. If I feel like overachieving, I do one of my favourite things: whisking up a little aioli or other creamy sauce (yoghurt and garlic together is a great proxy) while the salmon is in the oven. I’ll serve it alongside some herby, vinegary lettuces, a bowl of warm boiled potatoes and, of course, the salmon. It feels surprisingly elegant and thoughtful, the kind of meal that was cooked by a person who loves spending hours in the kitchen, but maybe, today, just didn’t feel like it. 3. 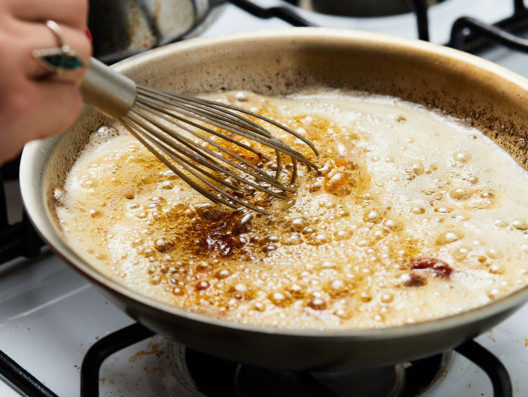 Add 2 tablespoons olive oil to the pot and whisk in harissa, letting it sizzle and toast a bit in the butter mixture for a minute or two. Add 2 tablespoons lemon juice and 2 tablespoons water to the pot, whisking to incorporate. 4. 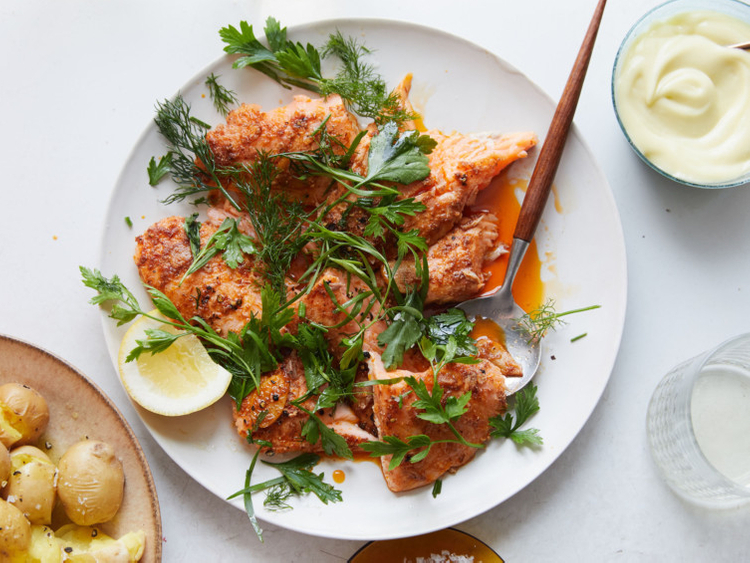 Season the brown butter-harissa sauce with salt and pepper and pour over salmon. 6. Meanwhile, toss shallot with 2 tablespoons lemon juice in a medium bowl and season with salt and pepper. Add lettuce and dill and toss to coat; drizzle with a bit of olive oil and season with salt and pepper. 7. Once salmon is just cooked through, remove from oven. 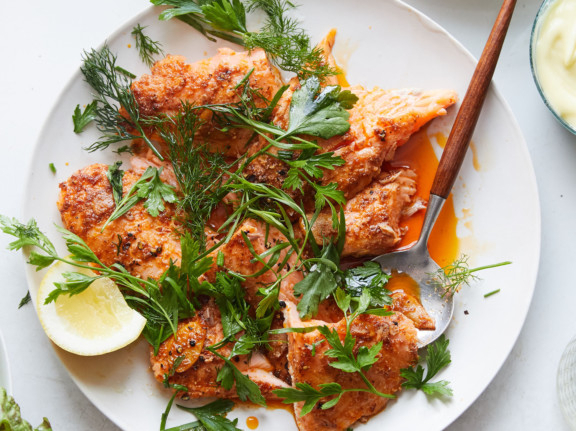 Use a large serving spoon to scoop large chunks of salmon onto a serving platter or individual plates, leaving the skin behind in the baking dish. (No need to worry if you get smaller chunks too, but try to get the largest pieces you can.) Spoon any remaining brown-butter sauce from the pan over the fish and squeeze lemon over the top. Sprinkle with a bit more dill, if you have it. Serve with dilly lettuce alongside, and, if you like, toast and aioli.